Last month, CIP participated in The Linux Foundation’s Embedded Linux Conference + OpenIoT Summit North America in Portland, Oregon. 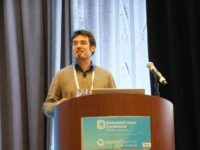 Around 730 embedded and IoT technologists from 360 companies and 31 countries around the globe attended the event to collaborate with experts on a wide range of topics of embedded Linux and industrial IoT issues. This was an increase from last year, making this an important industry event for embedded and IoT developers. In fact 75% of attendees already said they are planning on attending next year. CIP, which sponsored the event at the Gold level, had a strong presence at the show. 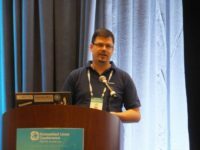 In fact, Philip DesAutels, Senior Director of IoT for The Linux Foundation, mentioned CIP during his keynote. 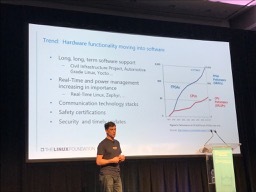 He was speaking about the increasing trend of how hardware functionality is moving into software and identified CIP as an important Linux Foundation project that is mission critical for the future of smart cities and industrial IoT by providing long term software support. CIP also had a booth in the technical and demo showcase that featured demos from Renesas, which displayed the Real Time Linux Patch, and Plat’Home, which showed the CIP kernel connected to its IoT devices. Each day of the conference, the showcase hall was packed with attendees who wanted to learn about the latest projects and products, view hands-on demos and interact with other community members. In fact, 98% of attendees survey said they visited sponsor booths. Additionally, 15 CIP technical experts attended the event from member companies including Renesas, Hitachi, Siemens, Plat’Home, Toshiba and Codethink for a face-to-face TSC meeting, collaborate with other projects and to attend the 12 keynotes and some of the 90 breakout sessions. Yoshitake Kobayashi, Senior Manager of Open Source Technology at Toshiba’s Software Development and Engineering Center and Chair of CIP’s TSC, also gave a talk about CIP’s mission to develop an open source industrial-grade software for civil infrastructure projects, starting with a 10-year Super Long-Term Support (SLTS) Linux kernel built around the LTS kernel. CIP expects to add other similarly reusable software building blocks that meet the safety and reliability requirements of industrial and civil infrastructure. CIP supports electrical and power grids, water and sewage facilities, oil and gas plants, and rail, shipping and transportation systems, among other applications. If you missed the session, you can watch the video here or view the presentation here. Other CIP members Wolfgang Mauerer and Jan Kiszka, both from Siemens AG, also showed their technical passions for other topics. 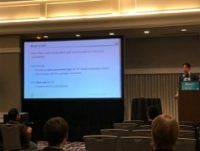 Wolfgang shared best practices, how to design and run automated statistical tests that capture relevant information, and how to properly evaluate the resulting data. Jan offered a deep dive into the Xenomai community, plans to revive it, maintaining the core and defining its relationship to PREEMPT-RT. The presentation is available here. Overall, the CIP members interacted with other open source projects, learned more about IoT best practices, shared their knowledge about embedded and Linux and got a chance to have some fun. Additionally, CIP will be attending Open Source Summit Japan on June 20-22 and the Embedded Linux Conference (ELC) Europe/OpenIoT Summit Europe in the UK on October 22-24. Stay tuned here for more details or come see us there!